Since the recent election, I was concerned about the outcome. The Republican candidate in Arizona for Senator won on election night. However, the Democrat candidate was declared the winner almost a week later. With other elections such as Florida and other states having allegations of voter fraud, I took it upon myself to at least in a small way look at the results myself. I started with getting the election results from previous elections, dating back to 2010 for comparison, going granular not only by county but by precinct in each county. Then I made a spreadsheet. Well, because I like to do spreadsheets and yes I am that guy. I did find some rather interesting results. First, let’s start with the simple number of registered voters versus actual votes counted. Obviously, A should never be larger than B, such as Precinct 1 would have 500 registered but only 300 voted including early ballots, provisional, etc. Here’s what I found. Apparently, the accounting is not correct, especially if these are supposed to be the official results. I also added the 203 column, which referred to Prop 203 in 2010 which legalized medical marijuana in Arizona. Again, it had the same pattern. Polls said Arizonians didn’t want it. Election night the vote said outright that they didn’t want it. But hey what’s this, a box? Oh, interesting there’s all these uncounted ballots, and well looky-here it just happens that there are enough votes that it did pass by 4,341. As I mentioned, these are from the official results from the Arizona Secretary of State. This alone shows that there is not a proper accounting in the least of whether the registered versus voters are legitimate. Here’s the breakdown by precinct. First, I am not showing the actual vote tallies merely because I do not know if they’ve been officially released to the public. First, since the vote tallies are yet to be released publicly, we won’t be stating those here. I just called up each county to ask and they either directed me to the location or they emailed it to me directly. So until I see that’s it’s been put onto the website as released I’m going to treat it as embargoed, just in case. What I have here are all 26 precincts that have more votes than registered. Column F shows the number of votes over and above what was registered. Columns H and I, well ok I guess I’ll show the votes here, no one tells anyone ok? Column J is the percentage of votes to registered, essentially the turnout. At the top is 67%, that’s the average throughout the state. As you can see going down the column these areas had an overabundance of turnout. And of course, the R and D is who won or a tie if the vote was the same for both. Therefore, column O is the amount of percentage over and above the state average. Yeah, granted, some areas had lower turnout over here and higher turnout over there. Taking these out for this point, there are areas that had 0% or really low turnout, and areas as high as 97%. However, Doney Park at 1824%? 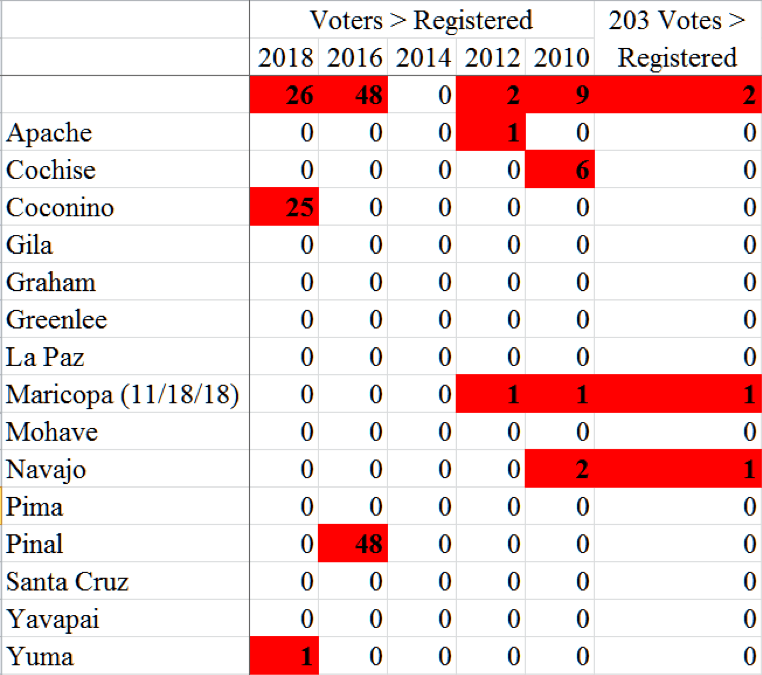 Oh, Yuma, it had zero registered voters and 19 actual voters, I have no idea how to calculate that one. So columns P & Q (sorry for S & T, ended up duplicating) are then weighted to that 67% average of what that vote might have looked like. This would mean that McSally would’ve had 3,408 votes less and Sinema 5,712. The next sheet I’ll admit is purely speculative, and you could shoot a thousand holes into it. What I did here was in each election going back to 2010 I looked at all the races to look at one specific criterion. On off-years such as this one, I looked at the Governor candidates, 2016 and 2012 were Presidential candidates. For each precinct I wanted to gauge whether it leaned Republican or Democrat, going by say for 2018 Precinct 1 carried the Republican, and so on. In total, I had five elections to base that on, so if a precinct went four or five for a given candidate I would say it would lean that way, less than that I disregarded it. I then asked some simple questions. How can this precinct that was historically Republican-leaning could vote for Sinema? That to me had a big disconnect. True, maybe McSally didn’t campaign there. Maybe she said she was anti-Trump and the voters didn’t like that? Again, many variables. But that’s a large number, as I show here that’s 11.4% of the precincts that for all five elections were leaning Republican decided to switch? 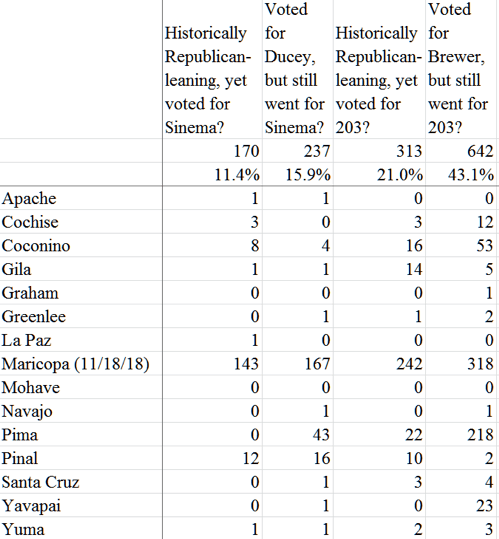 The next column is worse, looking solely at the 2018 election, those precincts that carried Ducey 237 decided to vote against McSally? Or more precisely voted for the Socialist candidate that in several videos referred to Arizona as the Meth lab of the United States, as well as the sixth C for crazy. Yeah, I’m sure Arizona wanted that. The next two columns I did the same questions for Prop 203, received even more stark numbers. Now granted, demographics shift. Precincts get redrawn, some are added to this election and others dissolved. And as I mentioned maybe McSally had her own issues with getting the message out. It’s just that to me this seems very odd, someone is going to explain it to me. So let me be clear. 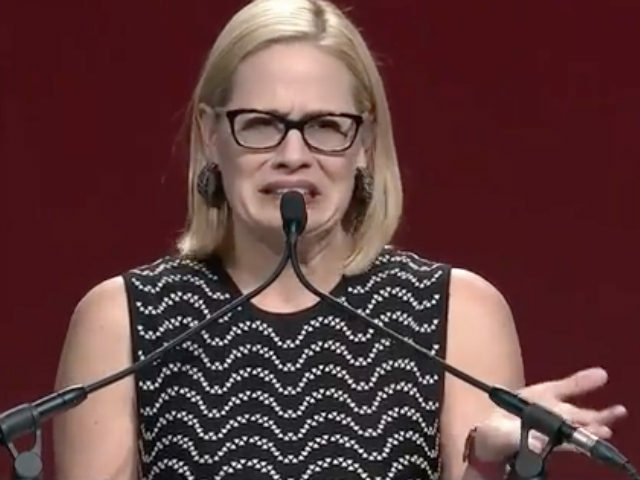 If Sinema won fair-and-square then so be it. The manner in which this was done leaves me with huge suspicions, and the released data doesn’t help that. In the very least it shows that the tallying has problems, either in the number of registration or in the vote counting. Granted, mistakes happen. However, did anyone pick up on the last columns I had, where it said R and D? The number of precincts that I note had 6 where McSally won and 20 that Sinema won. If you take out Yuma since I don’t know, zero registered voters, that gives 5 Republican questionable to Democrat’s 20. Right now I have serious doubts as to the legitimacy of Sinema’s election. Until those concerns are addressed, quite frankly, I do not recognize her as my Senator. There is too much potential fraud going on here, I don’t know what to make of it. Lastly, I do concede that it may be that the Republicans need to turn out the vote better next time. I made this sheet to show the weak points versus the strong and who won in each. Heck, the Democrats could even use this, I don’t mind if they use it, I don’t mind a fair fight. 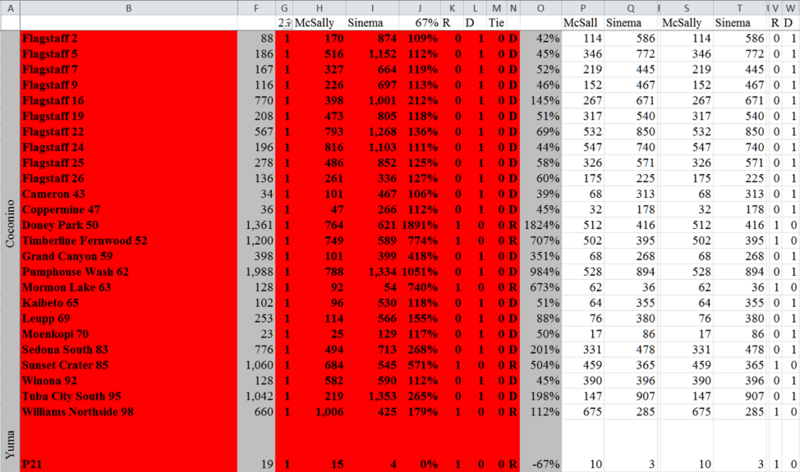 To See the Full Spreadsheet with all the Data, click here Full Spreadsheet.